David Bryce lived from 1803 to 7 May 1876. He became Scotland's leading Victorian architect, responsible for producing designs for over 230 buildings during his career, as well as a large number of minor works. His output covered a wide variety of styles, but he is best remembered as the man who perfected the "Scottish Baronial" style, the style that more than any other sums up Victorian Scotland. The wider picture in Scotland at the time is set out in our Historical Timeline. David Bryce was born in Edinburgh, the son of a successful builder. He was educated at the High School of Edinburgh, where he demonstrated considerable artistic aptitude. In 1825 at the age of 22 he joined the staff of the eminent architect William Burn. In 1841, at the age of 38, David Bryce became a partner of William Burn. 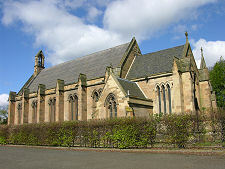 They prospered until 1844, when a dispute between the two over a commission to build St Mary's Church in Dalkeith for the Duke of Buccleuch led to their dissolving the partnership, and to William Burn moving to London. Bryce, now firmly established as one of the leading architects of his day, continued in practise alone, briefly taking into partnership Robert Anderson in the 1870s and, after Anderson's retirement, David Bryce's nephew John Bryce. David Bryce died on 7 May 1876, and the outstanding commissions at the time of his death were completed by his nephew. During his life, David Bryce was appointed a Member of the Royal Scottish Academy, a Fellow of the Royal Society of Scotland, and a Fellow of the Royal Institute of British Architects. Perhaps the most remarkable thing about David Bryce's work was its sheer volume and, partly as a result, the huge impact he had on the built environment of the Scotland we know today. His impact was even greater because of the number of his pupils and assistants who went on to become eminent architects in their own right. And although the name of David Bryce became associated with one particular style above all other, Scottish Baronial, his work encompassed a wide variety of styles. So what was Scottish Baronial? It has been defined as "part of the Gothic revival in architectural styles, drawing on stylistic elements and forms from castles, tower houses and mansions of the Renaissance period in Scotland". It came to the fore in the aftermath of the visit to Scotland by George IV in 1822, during a period that, largely thanks to the writings of Sir Walter Scott, saw a resurgence in interest in a separate Scottish identity: a period during which what had often become referred to as "North Britain" became, once more, "Scotland". The style was not invented by David Bryce, and many other architects also produced Scottish Baronial buildings, but over the course of his long career, he did bring the style to its culmination. To put this more practically, the Scottish Baronial style was typified by large comfortable mansions designed closely around the needs of their owners, and fitted carefully into a wide variety of landscapes. Stylistically, Scottish Baronial harked back to what was believed to be a "golden era" of Scottish architecture. 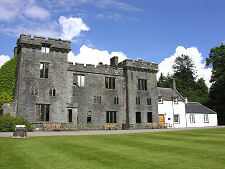 The result was grand houses that borrowed features from castles of an earlier era: of towers and turrets (or, often, of towers with turrets); of highly irregular rooflines; of pinnacles; of battlements; of crowstepped gables; of lancet windows; of porticos that imitated portcullises; and of heraldic shields and other decoration. 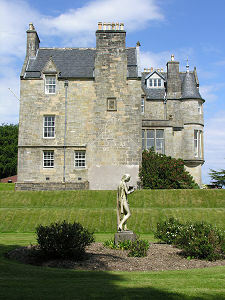 Many of these features came together in Balfour Castle, an important early work of David Bryce, dating from between 1846 and 1850. Like many other such projects it was a very large extension to an earlier building, it is asymmetrical, and it incorporates a tower whose purposes are purely decorative rather than practical. 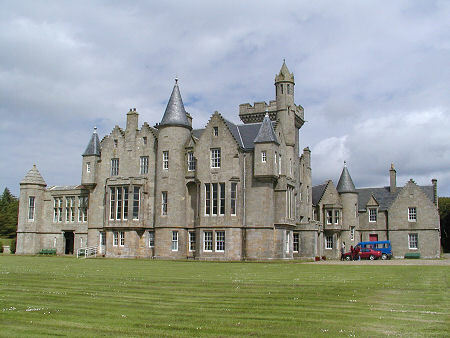 Balfour Castle also reflects another trend in Bryce's work, being sited in a remote location: in this case on Shapinsay, one of the northern islands making up the Orkney archipelago. Many of the elements seen at Balfour Castle also appeared at Torosay Castle on Mull, designed by Bryce and built in 1856. Here, too, a tower with no practical purpose pulls together the various elements of a roofline that incorporates a number of turrets and crowstepped gables. At Armadale Castle on Skye, Bryce had a tighter brief. A fire had burned down the central portion of a castle comprising two very distinct elements, and Bryce produced a design that drew together the surviving parts of the castle with a dominating central section that harked back to castles of an earlier era, with a roofline that was heavily castellated. 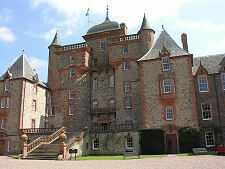 To see how Bryce's style evolved over time, it is interesting to look at Thirlestane Castle near Lauder, which he undertook alongside William Burn in 1840. Here an ancient castle was dramatically expanded in a "no expense spared" project for the 9th Earl of Lauderdale. The style that emerged owed more to French influence than many of Bryce's later works such as Glenapp Castle near Ballantrae, built in 1870. But throughout his career, Bryce was able to produce buildings in a wide variety of styles, and he had a particular impact on the Edinburgh we see today. In his own day, Bryce became as well known for his town and city offices, often for banks and insurance companies, as he did for his country mansions. Here his style was Palladian or Italianate, perhaps most spectacularly realised in his building for the British Linen Bank, built in 1846, which still survives on the east side of Edinburgh's St Andrew's Square. Bryce supplemented Scottish Baronial with French Gothic when producing one of his largest buildings, Fettes College in Edinburgh, which was built between 1864 and 1870. Perhaps the best known of his grand public buildings was the Bank of Scotland Building which stands on The Mound, and dominates views along George IV Bridge. It was built between 1864 and 1871. At the time of his death, David Bryce's was working on the Royal Infirmary in Edinburgh. His drawings for the hospital took into account all the latest thinking about hospital design, especially in light of Florence Nightingale's work in the Crimea. The building was completed under the supervision of John Bryce.